Our friends over at Cartoon Brew have a new article up about Cartoon Network’s new series (that’s plural!) they have announced for their upcoming 2014/2015 fall season. And, notably, there are several new series in the group with more than a passing Furry interest. Featured in the article is the new series Over the Garden Wall. “Cartoon Network’s first event mini-series, an animated comedy/fantasy story about two brothers, Wirt and Greg, who are trapped in a mysterious world. 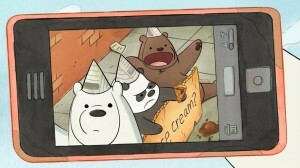 In this ten-part mini-series, Wirt and Greg must travel across this strange land until they find their way home, aided by a wise old Woodsman who gives them directions and a bluebird named Beatrice.” Next up is We Bare Bears, “…a comedy about three bear siblings, named Grizzly, Panda and Ice Bear. Each episode follows their awkward attempts at assimilating into human society, whether they’re looking for food, trying to make human friends, or scheming to become internet famous.” In Numb Chucks, “Woodchuck brothers Dilweed and Fungus didn’t always see themselves as mystical Kung Fu saviors until they stumbled upon an infomercial featuring mega legend Woodchuck Morris’ mullet-fueled motivational kung-fu video”. More familiar characters returning to TV include The Tom & Jerry Show (a new series of cartoon shorts from Warner Brothers), Be Cool Scooby Doo, Bugs Bunny returning with “new friends” Bigfoot and Squeaks the squirrel in Wabbit, and Sonic the Hedgehog in Sonic Boom. Check out the article for more detailed information on each of these and others.